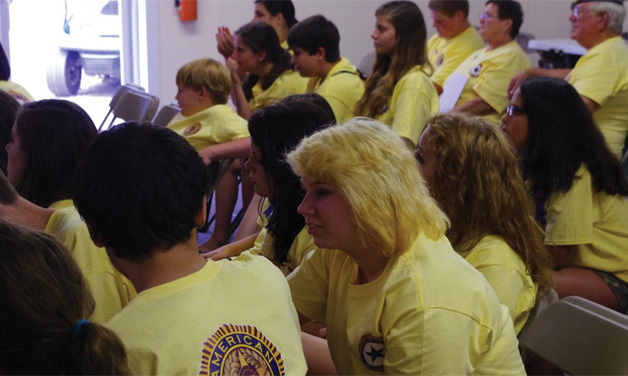 The American Legion and the American Legion Auxiliary sponsors a Leadership Camp for young Men and Women from Age 8 to 18 years of age. This Camp is set up to develop Patriotism, Leadership skills and to educate our Youth on many patriotic programs that The American Legion and the American Legion Auxiliary promotes. The American Legion and the American Legion Auxiliary has many programs that are supported by our youth. Some of the many programs are Americanism, Children and Youth, Boy State, Girl State, Leadership, Legislative and Veterans Affairs and Rehabilitation. This is a four day camp and during the week they are asked to go to the Flag Pole and participate in the raising of our American Flag and are also asked to participate in a non-denominational service followed by breakfast and a full day of activities. During the week there are several speakers who represent the various programs of The American Legion and the American Legion Auxiliary. The State Commander, The American Legion and State President, the American Legion Auxiliary are among the many speakers. Outside speakers that are prominent in the Communities and State are also asked to participate. Other programs taught during the week are the Histories of The American Legion and the American Legion Auxiliary, Flag Etiquette and the proper way to dispose of the American Flag through a flag disposal ceremony. Protocol and elections are held during the week to elect honorary officers. These Officers help and assist the Counselors helping to keep order and making sure that everyone is participating and sharing to make the week a success. The volunteers for this week are dedicated members of the American Legion and the American Legion Auxiliary. Through cooperative efforts and service the members and officers of the Legion Family show personal involvements to this program which makes it a success.